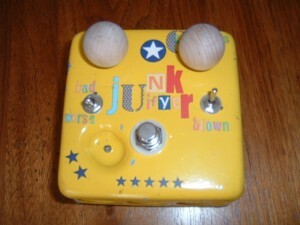 This was one of my very first pedals. I called it the “Junkifyer” and it’s based off of a circuit by Tim E. called the “LoFoMoFo”. Basically what it does is sends a guitar signal through a noisy transistor with a high pass filter. What that does is make your guitar sound like it’s being played through an old radio. I have a work a like design of my own that’s similar to this, but I added another transistor stage, and did the “Broken speaker” distortion differently. If I build them it will be under the same name. This pedal is Tim E.’s “PWM”. It routes the guitars signal through an oscillator, giving your guitar’s tone a synthy quality. It also has an LFO that will modulate the Osc. frequency in time with the LFO’s rate. I wired a switching jack to the frequency knob that will allow an expression pedal to control the frequency. Controls from left to right are= Volume, Frequency, LFO Depth, LFO rate. It has a bright blue LED to show bypassed state. This pedal is now with Shawn from Child Bite. I’ve built a handful more of these. I have one currently I need to take photos of that has a better LFO with triange and squarewaves. This is the Red Llama. 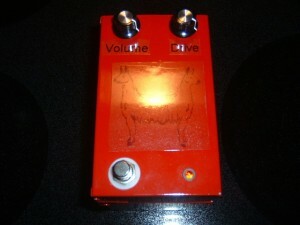 The circuit is a clone of the infamous (more then famous) Way Huge Red Llama. It gives fat tube sounding distortion. I disassembled this for a while to use some of it’s parts, but I decided to put this back together in a new enclosure to sell. 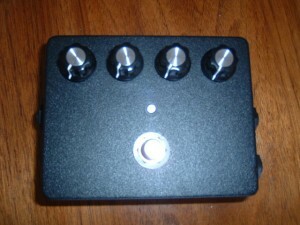 This pedal has now sold. This is John Hollis’ “Crash Sync” pedal. It’s an oscillator based distortion, pretty thick and noisy. I added the envelope control from Moosapotamus’ “Auto Crash”, and also did a few modifications circuit bender style. I found a two points that change the timbre of the oscialltion. One makes it a more mid-rangey wah type sound, and the other causes the Osc. to be prominent then the guitar’s signal. I also added a momentary stomp switch that removes the guitar’s signal completely for some laser gun fun. Hearthrob Tremolo by MarkM. I had an old Kay Tremolo that I foolishly sold, and now that I’m trying to build a pedal board I knew that I would need a good tremolo. With simple controls this one really gets the job done. Speed works as described, and there is also a switch that will decrease/increase the speed in half. The really cool feature is the “Dwell” knob. This allows you to dial in exactly how deep you want the tremolo to be. From sublte waver to full on choppy thumps. 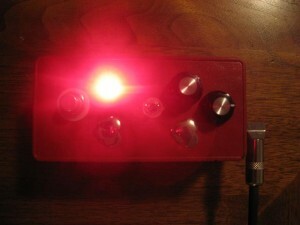 I added the mod to make the LED pulse with time of the tremolo. I’ve reboxed this pedal due to space, just need to take an updated photo. This pedal is currently on my “surf” pedalboard. Built this from a project a found online. First time using an etched PCB. Thanks to John Lyons for making them. 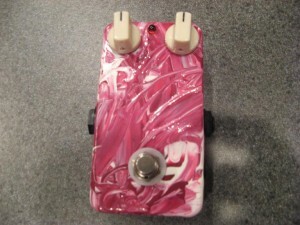 Check out his site for awesome wood pedals enclosures. I’ve added several mods to this pedal. The switches on the back control a bass boost, gain boost, clipping switch (asymetrical diodes and LEDS), and a switch to change the diodes to symetrical. This pedal is currently loaned out to a friend. The Psychtar is a Sitar simulator+Octave fuzz. It’s another of Tim E.circuits. Really cool pedal. I gave this to my friend “P” before I could take a photo of it. Hope to get one soon. I’ve built another of these since. I’ve built another one for myself, just need to get a photo of it also. This pedal is in my current rotation. Awesome project from the guys at . Pics soon. This is a great very light overdrive. The exact sound I was looking for when I first started building pedals. Pefect for Rockabilly, roots, and surf. This pedal is on my pedalboard. My first “Kit” pedal. 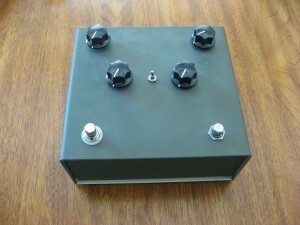 This “Build your own clone” kit is a work-a-like of the original MKII Tone Bender fuzz pedal. The awesome thing is it came with NOS OC44 Germanium transistors! I added a switch that takes out the booster stage making it more like a Fuzz Face, and I brought the bias trim pot out on the case. Pics soon. Came free with my ESV Tone Bender kit from BYOC. I made it into a true boost pedals by mounting it in an enclosure, adding a bypass switch, and outboarding the boost trim pot.